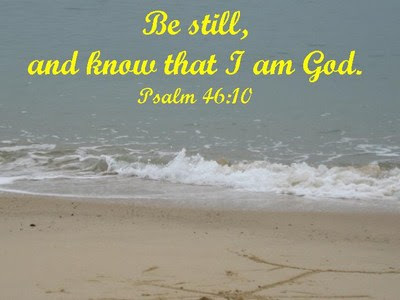 More than Conquerors: Word-Filled Wednesday : Be still, and know that I am God. Word-Filled Wednesday : Be still, and know that I am God. No matter what we go through in this life, may we always find peace and comfort in the Lord because He is our God! May this be our comfort today and everyday! For more Word-Filled Wednesday participants, do visit Amy at The 160 Acre Woods. It will be a very blessed and encouraging experience for you. Thank you for stopping by. Thanks for your prayers and encouragements. Hope you have a blessed day! Thanks for these wonderful verses, such comfort to my heart. What a simple, yet profound statement. Not always easy to "be still" as you well know. Great assurance in these words, Nancie. Thanks for sharing & have a blessed day! I agree w/ Tracy. It's not always easy to be still. I love to get away to the Virgin Islands. There, it is easy to be still and listen. It's harder in my real world, but so worth taking the time for. Thanks for sharing your WFW. One of my favorite verses! So true!!!! I go to this verse so often. Coz the Lord sometimes says, "Hey Lea... be quiet, and just look UP!" He has been teaching me this over and over.. coz it's not about us it's about Him." Thanks for this visual today, and reminder. Nancie, Thank you so for sharing this verse today. I am trying to learn to "be still" more. It's so hard for me.. I want to be up and moving and going all the time. However, you know, you don't always hear God that way. I need to be still. AMEN! At times its hard to BE STILL. But when we do, oh how much easier our life and challenges are! Great verses that offer comfort and freedom from fear. Happy WFW! be still... i'm working on learning that! God bless you for sharing such a lovely photo picture and verse. Just what I needed to hear today. I love the verse! The beach in the photo looks like ours at the moment - coooold! Happy WFW! I love this verse. Thank you for the reminder - I needed it today. One of my favorite scriptures. One I must remind myself of alot! Because it is so hard to be still and wait. But there is great comfort in his words. Thanks for sharing and reminding us. Thanks for coming by and visiting today. p.s. BTW there is a place in my heart for Singapore we had friends that lived there for a few years. I love this thank you for the reminder to actually practice it. Thanks for checking out my spot and for your words. What a beautiful picture and verse. It is sometimes hard to "be still", but something that is so needed. Thanks for sharing. Thanks, dear friends, for stopping by. Thanks for all your prayers and encouragements. They are great comfort to me and I thank God for all of you. God bless!